Ships from and sold by Q-Based Solutions. Ships same day or within 24 hrs. Ships UPS or USPS Gift Wrap available. Mange Spray Products are priced comparable to other mange treatments. How Do Our Cure For Mange Work? Our Mange Spray Treatment is Easy-To-Use proven highly effective mange treatment. Perhaps that's why we have seen a surge in demand for this Mange Spray product over the last several years. Use it to eliminate trips to the dog or cat groomer to get treated for the pesky irritation. EFFECTIVE USES: Safe to use directly on skin ravaged by Sarcoptic, Demodectic, and Notoedric Mange. Cleans and promotes healing. Safe to use on all animals including birds and mites on reptiles. Also remember to use PetsBestRx Healing & Protection Spray to combat the effects of the harmful bacteria on their skin, which can cause odor other serious problems for your pet. or Call 1.866.314.8917 To order via our 128-bit Certified SECURE server, have your credit card ready and select the offer that best fits your needs. For more information on returns, please read our Company Policy. 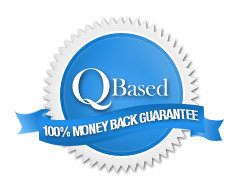 Q-Based Solutions is so confident that they have the right skin solutions, we guarantee our products.